Additional onsite experiences, as well the official pre-party, an Inaugural Kickoff Dinner at Chicago's Goose & Fox, and after-show events have been announced for the first annual Chicago Open Air. The three-day music, craft beer and Gourmet Man Food festival held July 15, 16 and 17 at Toyota Park in Bridgeview, IL, just outside Chicago will feature a spectacular music lineup. 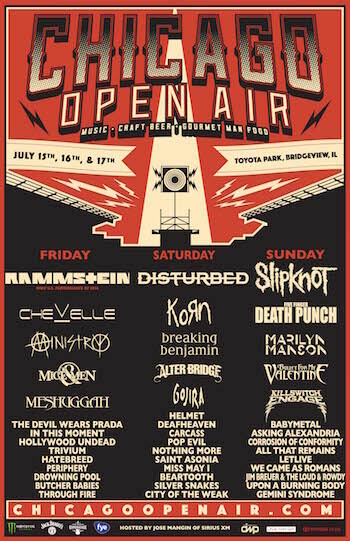 Overall, Chicago Open Air will feature performances by more than 40 bands, including Rammstein (the group's only 2016 U.S. performance and first Chicago show since 2012), Chicago's own Disturbed (who recently returned from a 4-year hiatus with their #1 album Immortalized), global rock juggernauts Slipknot, Chevelle, Korn, Five Finger Death Punch, Ministry, Breaking Benjamin, Marilyn Manson, Of Mice & Men, and many more. The festival will also include Gourmet Man Food featuring local and regional cuisine, a craft beer village highlighting top brews from the region, other entertainment and fan experiences, and will be hosted by Jose Mangin from SiriusXM. A limited number of single day tickets will be released for purchase on Friday, June 10 to celebrate Father's Day weekend. Single day tickets will only be available while supplies last. Weekend General Admission and VIP tickets are on sale now at www.ChicagoOpenAir.com. The official Chicago Open Air Pre-Party presented by 95 WIIL Rock and 100.7 QRock will be held at Concord Music Hall on Thursday, July 14. Otep headlines the show with Shaman's Harvest, Islander and Through Fire supporting. Chicago Open Air ticket holders will have the opportunity to purchase discounted tickets in advance for $10. Regular tickets are $17. 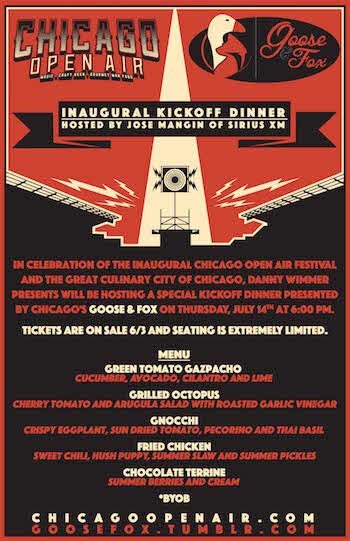 In celebration of the inaugural Chicago Open Air festival and the great culinary city of Chicago, Danny Wimmer Presents will be throwing a special Chicago Open Air kickoff dinner presented by Chicago's Goose & Fox and hosted by Jose Mangin of SiriusXM on Thursday, July 14 at 6:00 PM CDT. The BYOB dinner will feature five courses with seasonal and local ingredients from Midwestern farmers for $75.00. Limited tickets are on sale now at http://www.brownpapertickets.com/event/2560621. This unique METAL themed bar is a 100x80 dive bar experience complete with Marshall amplifiers lining the back wall, a unique jukebox playing heavy metal music, rocker pinball machines, Chicago favorite Kuma's Corner serving their signature metal themed burgers just next door, and more that will give fans a dark, heavy metal, craft beer and cocktail experience all on site at Chicago Open Air. The Headbangers Beer Hall will feature national and regional craft beers and artist inspired beverages including: Goose Island (Chicago — 312 Urban Wheat Ale, Four Star Pils), Half Acre Beer Company (Chicago — Daisy Cutter Pale Ale, Vallejo IPA, Pony Pilsner), Iron Maiden's TROOPER Beer, Lagunitas (Petaluma, CA — IPA, A Little Sumpin' Sumpin'), Motörhead Wine, Surly (Minneapolis — Surly Hell Lager, Surly Furious IPA), Two Brothers Brewing (Chicago — seasonals TBA), and more to be announced. Look for unique experiences throughout the weekend with members of bands at the bar, as well as former MTV Headbangers Ball host and Cathouse founder Riki Rachtman playing some of his favorite songs and guest bartending during the weekend. Offering the best burgers in Chicago, Kuma's started in 2005 with its flagship location at the corner of Belmont and Francisco avenues in Chicago's Avondale. From their origins as a corner bar with solid American bistro fare, they've grown to two locations that offer the finest burgers available on this planet or any other. Kuma's ethos is simple: Support your community. Eat beef. Bang your head. Look for the official Chicago Open Air #GourmetManFood burger at Kuma's, and for their full menu to be announced soon. f.y.e. will be hosting the ultimate fan and artist interactive experiences throughout the festival. f.y.e. is the only place at the festival to get all your favorite band's music — and maybe even get to meet your favorite Chicago Open Air performers. Check back for updates on artist meet and greet and autograph signing sessions. Chicago Open Air sponsors include: Monster Energy, Jack Daniel's, f.y.e., Dyin 2 Live / Fxck Cancer, Take Me Home Animal Rescue, El Jimador Tequila, The Music Experience, Roadrunner Records, Century Media Records and more to be announced.